Global equity traders are no longer panicking about the world’s slowest growth rate in seven years. They’re warming up to shares of companies that are most sensitive to the economic cycle — miners, technological and industrial firms — while turning away from utilities and consumer staples. 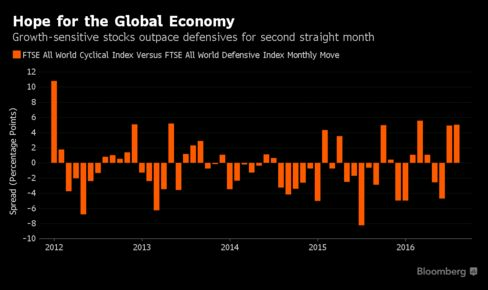 The FTSE All World Cyclical Index is on track for its best two-month showing since 2012 relative to the FTSE All World Defensive Index, with members including Japan’s Toyota Motor Corp., Korea’s Samsung Electronics Co. and Switzerland’s ABB Ltd. soaring more than 12 percent. While stocks have been ripe for a rotation for most of 2016, investors worldwide have been unwinding bets for a grimmer growth outlook in recent weeks amid better-than-expected economic and earnings reports and central-bank assurances of supportive policy in the wake of the U.K.’s secession vote. While bears doubt that the cyclical recovery will last, bulls are eyeing the turnaround as the beginning of the end for the three-year dominance of defensive stocks. Economic data worldwide have beaten forecasts since the beginning of July, with Citigroup Inc.’s surprise index reaching its highest since February 2014 this month. American employers in July hired an unexpectedly large number of workers and new-home sales jumped to an almost nine-year high. Federal Reserve Chair Janet Yellen said Friday the U.S. economy is approaching the central bank’s goals for employment and price stability. Traders have since forward bets for future rate increases. In Europe, an index tracking European services and manufacturing showed the fastest expansion in seven months, while industrial production in India, China and Mexico continued to grow. Economists forecast global growth of 3.2 percent next year, versus 2.9 percent in 2016. Also lending credence to the argument that expectations were too bearish is the latest reporting season — U.S. companies exceeded profit estimates by the most since 2014, while almost two-third of European firms beat projections, BNP Paribas Investment Partners’ multi-asset team wrote in an Aug. 23 note. In Japan, earnings surpassed forecasts after two quarters of falling short, data compiled by Bloomberg show. Globally, analysts’ upgrades to earnings estimates are outnumbering downgrades for the first time since 2014, according to a Citigroup index. The FTSE All World Cyclical Index has jumped 9.5 percent since the end of June, versus a drop of 0.7 percent for a similar gauge tracking shares considered less reliant on the economy. On an annual basis, the economically sensitive gauge is poised for its first outperformance since 2012. Samsung, oil-services giant Schlumberger Ltd. and power-grid maker ABB have jumped 16 percent or more in 2016. Defensives such as Johnson & Johnson, Coca-Cola Co. and Nestle SA are all down from their all-time highs reached earlier in the year. Not everyone is convinced the reversal will continue. Skeptics include strategists at HSBC Holdings Plc, who predict the cyclical rally won’t last because it’s “running on fumes,” according to an Aug. 21 note. The recovery “appears to to be built more on hope than any underlying improvement in fundamentals,” strategists led by Ben Laidler wrote. Some investors are holding on to growth-sensitive stocks, betting they will pay off in the longer term. As central banks around the world delve deeper into their tool kits for ways to protect the global economic recovery, governments will soon be able to follow with increased spending and lower taxes, says Pierre Mouton, a fund manager at Notz, Stucki & Cie. in Geneva.